SAY “AHHHH.” Do you dread going to the dentist just as much you disdain attending children’s birthday parties and doing your taxes? They’ve transformed a 15,000-square-foot space into their high-tech vision of the dental clinic of the future, one designed to decrease patient wait times, lower stress levels, and maximize comfort, according to an article published by The Outline. RFIDS EVERYWHERE. At this clinic, a patient starts by signing in at an online portal. They receive a wristband equipped with radio-frequency identification (RFID) to wear throughout the rest of their visit. This allows the clinic’s staff to always know where the patient is, what procedure they’re receiving, and any additional information about the patient. No more “lost charts” to slow things down. The clinic also includes RFID trackers on its chairs that note when patients and doctors “sign in” for a procedure. This could let staff know how long patients typically wait and address issues if they arise. The RFID tracker in the chair can also link up with the one on the patient’s wristband, noting the position the patient preferred during their last visit and automatically adjusting itself to match it. RFID tags on six dental instruments track everything about their use, from when someone uses them and for how long to the last time someone cleaned or sharpened them. A BETTER EXPERIENCE. A pair of cameras installed in each dental chair record each procedure, giving the dentist the opportunity to analyze their own work or that of other dentists. Meanwhile, a 3D milling machine dramatically decreases the amount of time needed to produce a crown, from the standard two weeks (the time it takes to send a patient’s info to the manufacturer, who makes it bespoke to the patient) to just 15 minutes. Perhaps the most exciting development for those who dread the dentist is the tech to track patient stress levels. Within the next six months, the clinic plans to equip each of its 48 digital chairs with biofeedback systems. These systems will measure patients’ heart rates and oxygen levels during procedures. 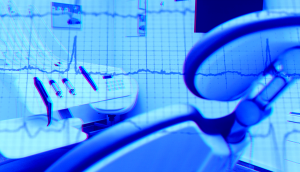 Eventually, the clinic might add facial recognition capabilities to the chairs’ cameras to further improve the dentist’s ability to know when the patient is experiencing stress or pain. This could let dentists know when patients need a break or if what the dentist is doing is painful, even if the patient doesn’t speak up. BETTER CARE. The clinic’s high-tech take on dentistry has the potential to improve more than a patient’s experience. By leveraging all the data it collects about patients both during and after their procedures, it could also improve their dental care. For example, if the clinic notes that a certain type of person is more likely than others to experience complications during a procedure or need extra pain meds afterwards, it might chose to take a different approach for their treatment. For now, the clinic is still a singular example of what the dental care of the future could look like, but as Steven Erde, Columbia’s College of Dental Medicine’s chief information officer, told The Outline, it’s already generating “significant interest” from clinics across the nation. That means you might not have to wait too long before you find yourself actually able to relax once settled into a dental chair.